Chiang Mai is the largest city in northern Thailand. On my visit to Thailand, I stayed five days in the town mainly to celebrate Songkran. 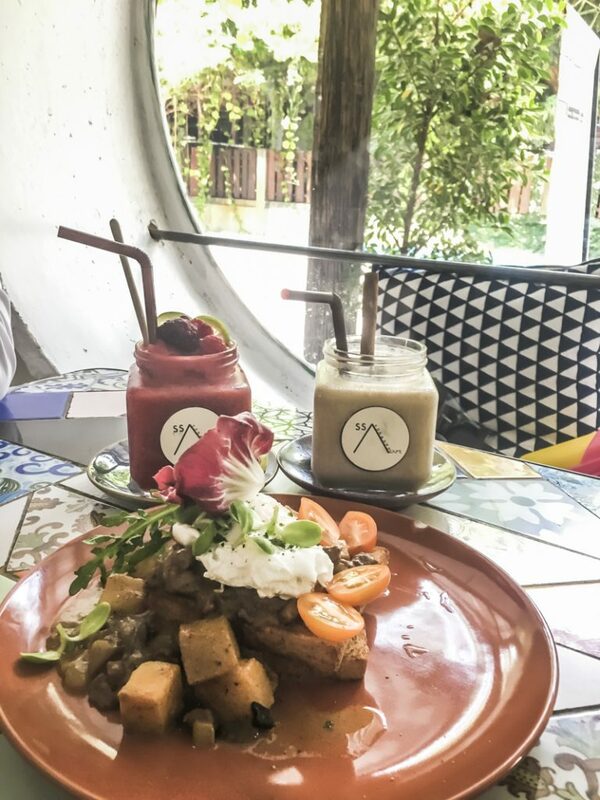 However, Chiang Mai offers so many fun things to do for travelers beyond temple visits to waterfall chasing to hiking to exotic animal experiences. I could’ve easily stayed for ten days in this chill town and never get bored. READ MORE: See the Cute Elephant Photos and Read about One-day Volunteer Program at Elephant Sanctuary in Thailand. 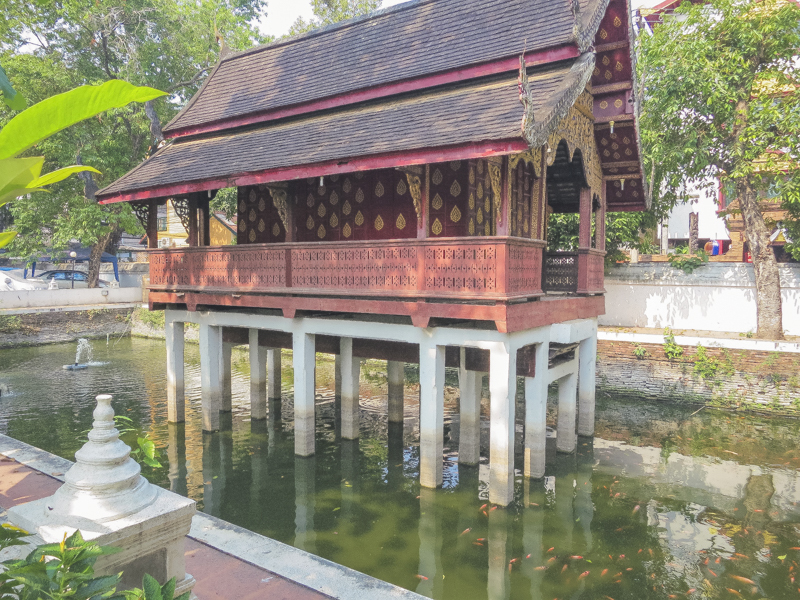 After visiting many temples in Bangkok, I felt “templed out” by the time I got to Chiang Mai. 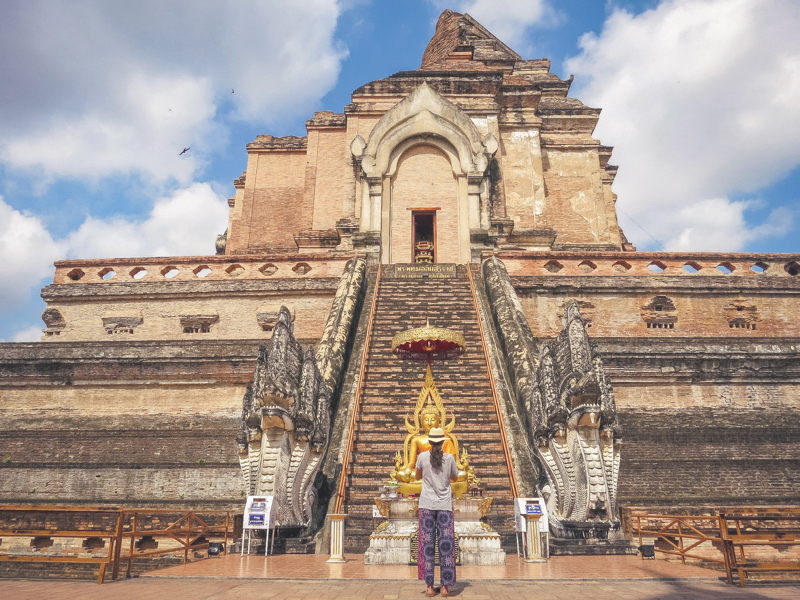 As Thailand has no shortage of temples everywhere you go, you might feel the same way. 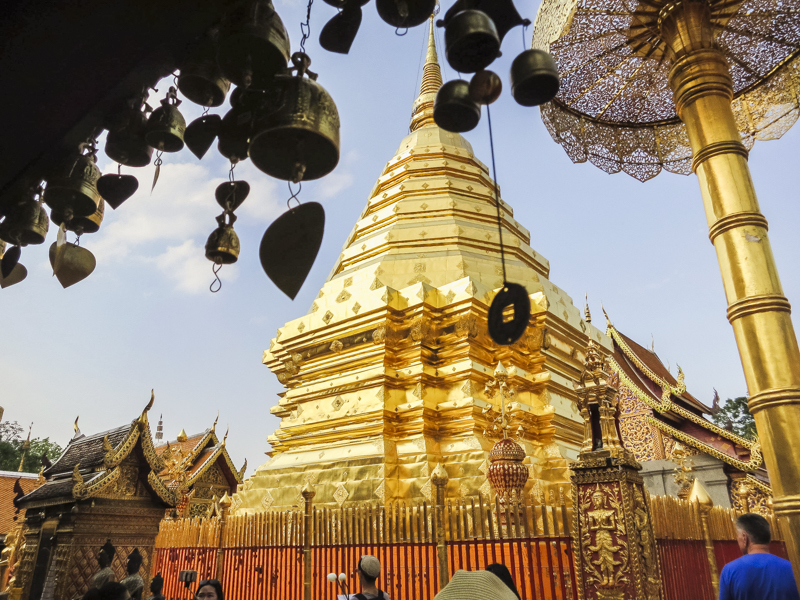 But even if you do, Wat Phrathat Doi Suthep should be on your list of the places to visit in Chiang Mai. It was my personal favorite.Doi Suthep is located on top of the Mount Suthep, which is about an hour ride away from the Old City. The day we arrived in Chiang Mai, we rented a scooter via the hotel we stayed. We paid 250 BHT for 24 hours. We rode the scooter to Doi Suthep. Hiking up the steep dragon stairs on a scorching hot day was challenging. But once I got to the top of Mount Suthep, the giant gold stupa and elaborately decorated temple stood in front of me. Wow, it was quite the scene!Some people were walking around the giant gold stupa in circles with a white flower in their hands. 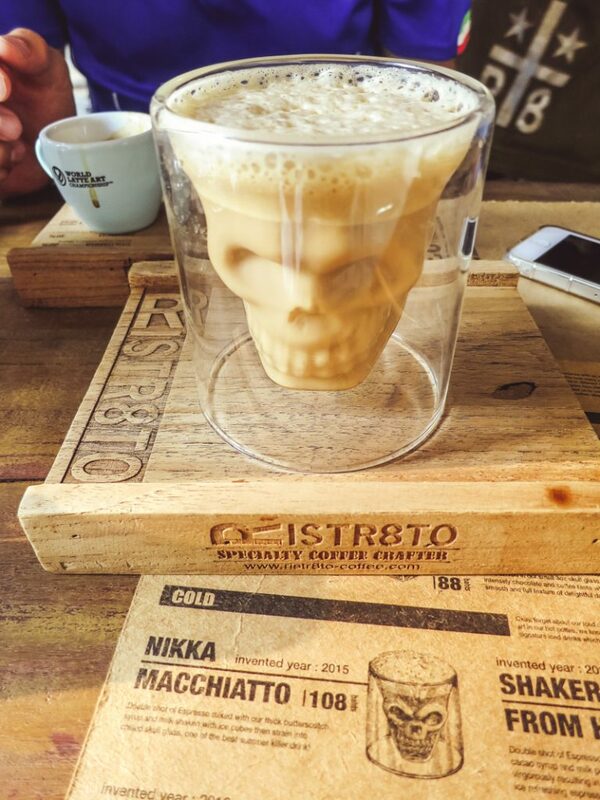 Although I wasn’t sure what this ritual was about, it looked interesting. On the side of the giant stupa, I also noticed a line of people waiting to wash off mini stupa with water. I joined them and donated some money. Pity no one was there to explain what this signified!April in Thailand was too hot. I was already drenched in sweat from hiking up the stairs; the temple was not air-conditioned. Before entering into the temple, everyone had to take off shoes. My bare feet couldn't bear the heat from the floor any longer. Otherwise, I would’ve stayed much longer because the view at Doi Suthep was stunning. 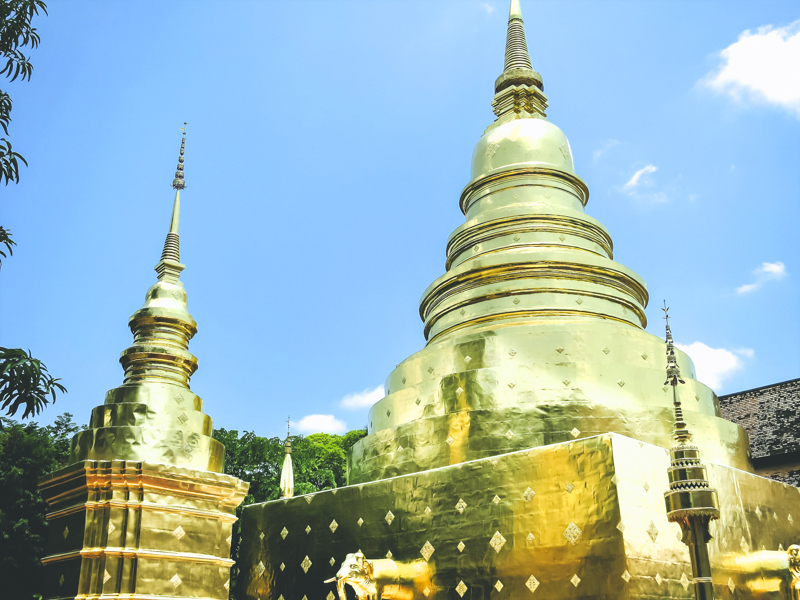 Wat Chedi Luang is probably the most famous temple in Chiang Mai. My hotel was around the corner of this temple. I actually could see the tip of the temple from the balcony. It didn’t look fancy or elaborated like other temples in Chiang Mai. Although I thought about skipping, I decided to swing by as it was too close to miss. It turned out what I saw from the balcony was the tip of an iceberg. This temple was as beautiful as others. Doi Inthanon National Park is perhaps the most underrated place to visit in Chiang Mai. Do not scratch this off your list just because it is not in the city. Hiking the highest mountain in Thailand leading to Doi Inthanon National Park is well worth your time. 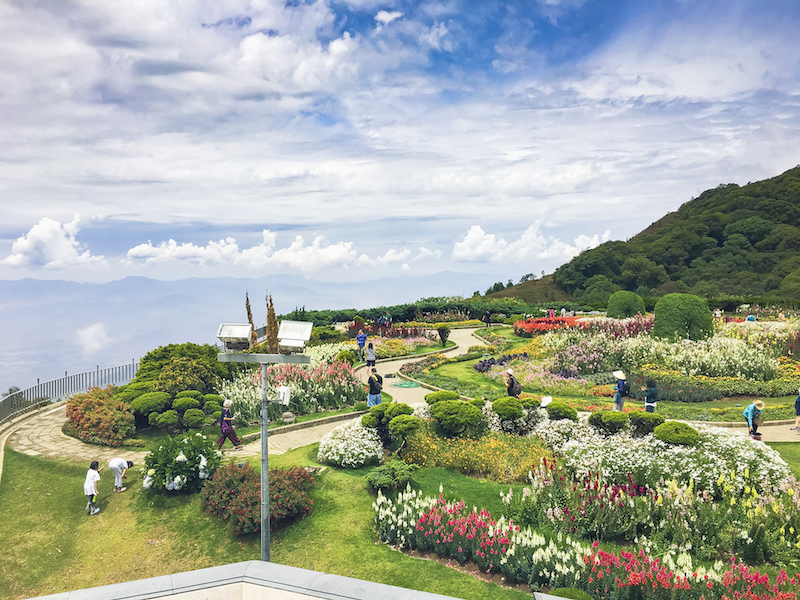 The Royal Pagodas and Queen’s Garden on top, overlooking the mountain, is breathtakingly beautiful. You do not want to miss it! 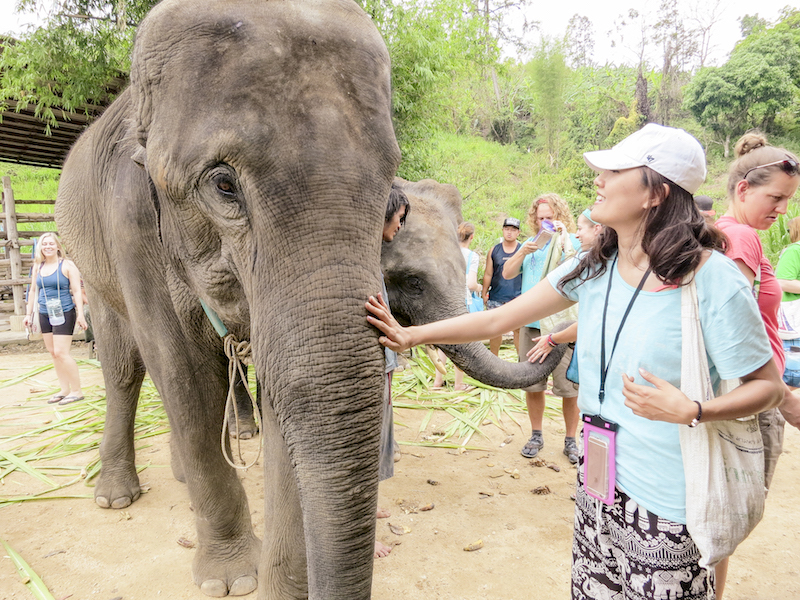 If you love animals and are looking for ethical animal experience, why not volunteer at one of the elephant sanctuaries in Chiang Mai? I opted for a full day program where I got educated about Thai elephants, fed breakfast, mud-bath the retired elephants and swam with them. These elephants were darn cute and smart. And they loved to hang out with human friends. It was by far the best animal interactions I’ve ever had. 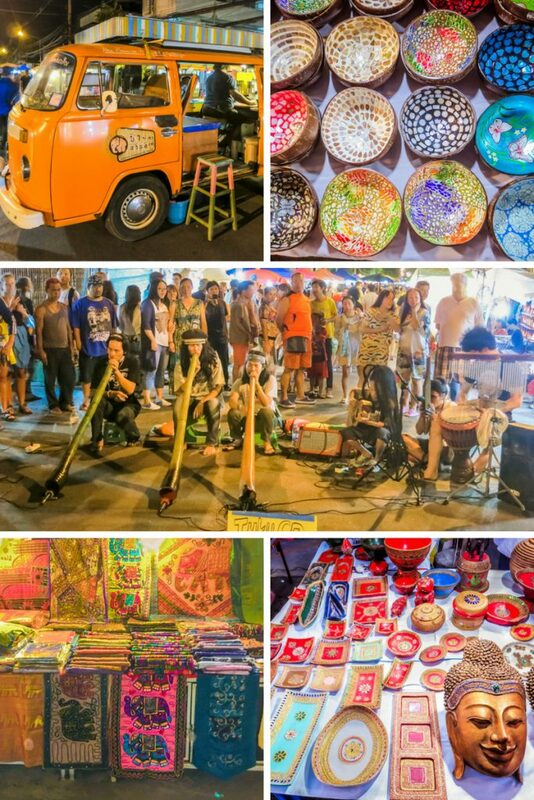 One way to enjoy Chiang Mai’s nightlife is to wander around Night Bazaar. After the city was cooled down, locals and tourists all seemed to migrate into the streets. It was tough to figure out which street the Night Bazaar started, so I walked towards the market until I saw venues and stalls. 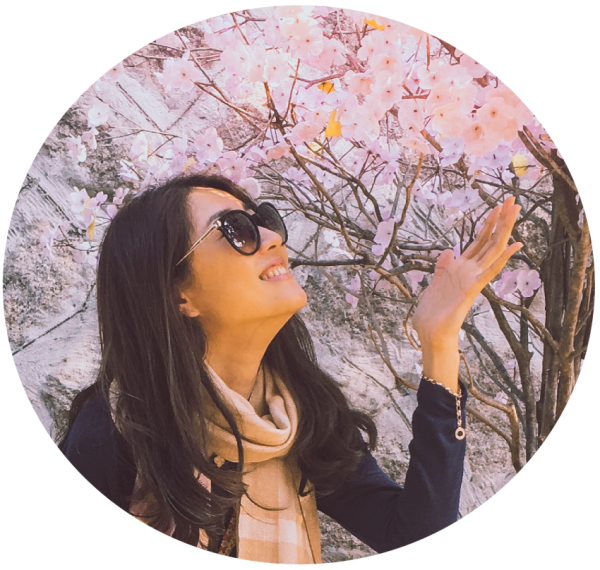 My mission was to focus on finding authentic street foods. While I did get some shopping done, I was holding out to shop at the much larger Sunday Market. However, you can shop for Thai classics such as elephant pants, handmade jewelry, wood carved elephants, etc. Bar hopping is also an option in this area. As the location was outside of the city wall, I rode Songthaew back to the hotel. ?Location Map | Hours: Everyday 6 p.m.-10:30 p.m.Side Note: There is also Saturday Market, which is similar to Night Bazaar. It opens 4 p.m. - 11 p.m. on Saturdays. 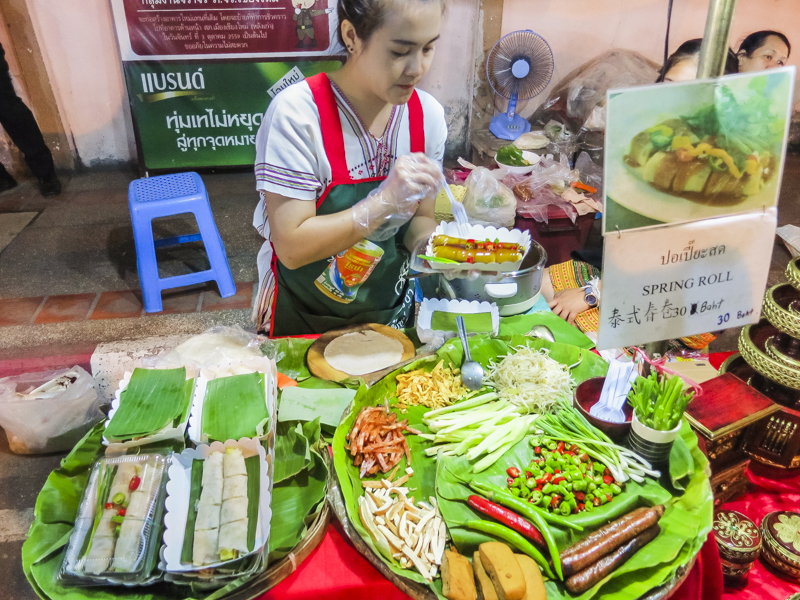 Chiang Mai’s Sunday Market is the most extensive night market and offers a good mix of food and shopping experience. It is the best place to buy souvenirs, hands down. This market has accessories, home goods, arts, clothes, bags and everything else you can imagine finding in Thailand. I think craftsmanship differentiates this market from the others. It is quite extensive but not overwhelmingly so as the Chatuchak Market in Bangkok. Generally speaking, the price was better compared to Bangkok night markets. I ended up buying a lot more than I should have, but definitely no regrets.Pro Tips: Do not buy any Buddha or elephant ivories. Bringing those out of Thailand is illegal. ?Location: Along the Ratchadamnoen Road. Map | Hours: Sundays 5 p.m. - 10 p.m. 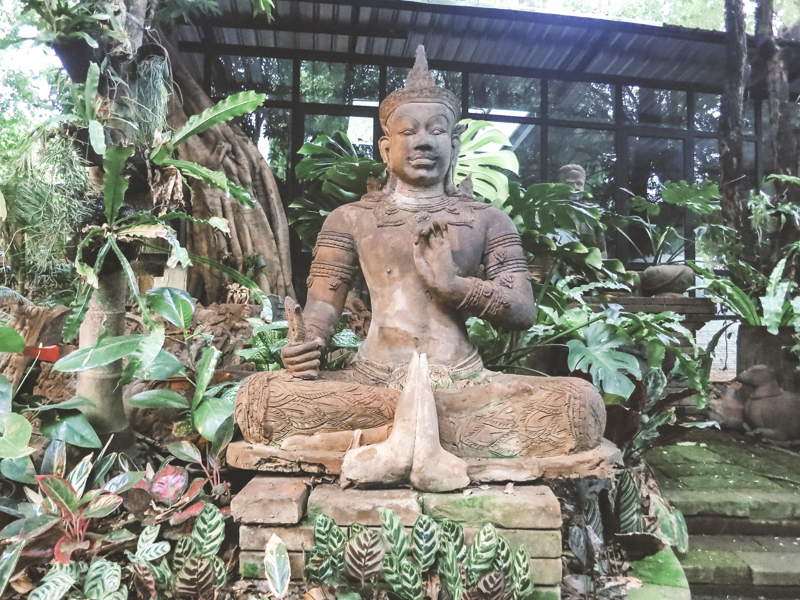 When in Thailand, why not indulge yourself in Thai massage? At first, I was hesitant as this scary image of Thai masseuse bending and cracking my joints had stuck in my head for some reason. But after a positive experience with a Bangkok masseuse, I became a huge fan of Thai massage. I was determined to get one every night in Chiang Mai. While I had no problem walking into a massage shop in Bangkok, most of the affordable massage places in Chiang Mai got booked up quickly. I ended up getting a massage at two random places off the busier primary street. I got lucky with one and not so much with the other. So do research and book a couple of days in advance in Chiang Mai. As I dedicated two full days on Songkran, I didn’t have enough time to visit the White Temple. 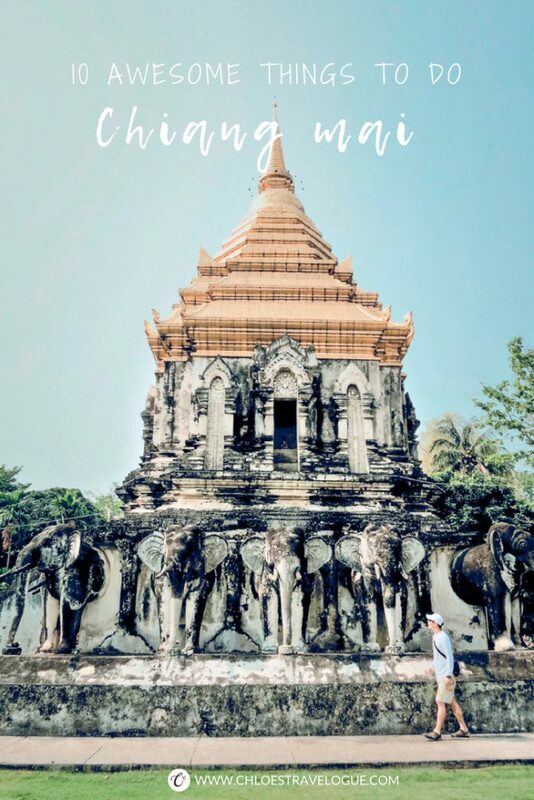 Many others traveling to Chiang Mai take a day trip to Chiang Rai to see the White Temple. Based on the images I saw online, the temple looked very special. I would love to see this temple in person.Does this list pique your interest? If yes, please spread the love.